A solitaire game for the decktet. Shuffle the Decktet thoroughly. Deal five cards face down into a pile, and another five cards to the right of that. Deal three cards face down below and slightly to the left of the first pile. Deal one card sideways face down, and then three more cards face down in the same pile (For a total of seven cards, the fourth one sideways.) Deal two other piles the same way, one to the right of the first one, so that is below and in between the top piles, and one one below and to the right of the top rightmost pile. Deal two more piles the same way as you dealt the first two (With five cards each.) under the three middle piles. Finally, turn the top card on each pile face up. The entire setup should come out in a hexagon shape. The goal of the game is to combine all of the cards into one single pile, face up. 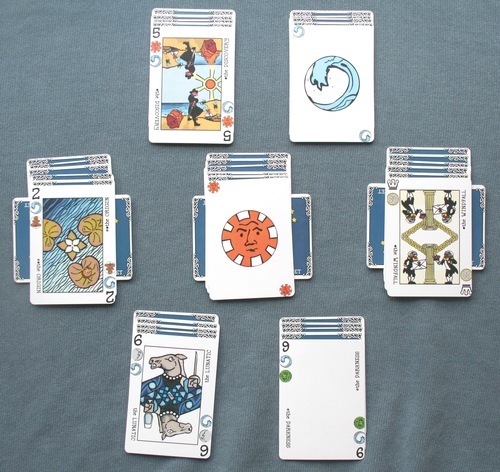 Each turn, you may take one card, and move it onto an adjacent card that shares at least one of it's suits (Also move any face up cards under it with the move.). This will leave one card face down, turn it face up immediately. If you reveal a sideways card, that card must immediately 'jump' to an adjacent card that shares at least one of it's suits. If none of of the surrounding cards share a suit, then you 'flip out' and the game is over. If any of your seven piles runs out of cards, you cannot move cards back into it. That pile is empty for the rest of the game. Be careful that you don't leave any piles stranded. If at any time, it becomes impossible to move any cards onto a adjacent card that shares at least one suit, the game is lost. Victory: If you combine all cards into a single pile, with all of them flipped face up, you win!